Take advantage of the low GainSaver price on this 13-inch GainSaver refurbished MacBook Pro with an Intel Dual Core i5 processor running at a fast 2.5GHz. This is a Mid-2012 MacBook Pro. It gives you significant savings when compared to a new MacBook Pro, but still provides the performance of a late model Mac laptop. It includes the 30 Day Money Back Guarantee you always get from GainSaver. Not only that, you can configure your MacBook Pro with just hard drive, memory and optical drive of your choice. This 13-inch MacBook Pro has a brilliant wide screen display with a high 1280x800 pixel resolution. You dont need to sacrifice image quality even with a convenient 13-inch display. Watching videos or communicating with FaceTime HD is a pleasure, while still remaining light and easy to carry - weighing in at only 4.5 pounds. One of the strong points of this used 13-inch MacBook Pro is its built-in optical drive. New MacBook Pro and iMac models do not have the internal optical drive any more. You need an external optical drive if you want to watch movies on DVD or burn your own backup discs. If you are accustomed to using a desktop computer, you wont miss having a mouse while using this discount MacBook Pro. Navigation with the Multi-Touch Trackpad is fast and easy. You have incredibly fine control. Swipe, pinch and tap the spacious Multi-Touch Trackpad anywhere on its large glass surface to scroll through documents and web pages. Youll quickly prefer it to a mouse. 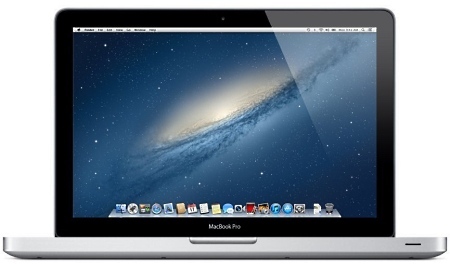 The Mid 2012 refurbished Macbook Pro is a really fast Mac laptop with desktop computing power. Youll blast through all your work, whether you are answering email, composing text, running spreadsheets, doing complex data analysis or editing video. The 2.5GHz Dual Core i5 processor from Intel has processor, cache and graphics processor all together on the same chip. This means the internal shuffling around of data is kept to a minimum, so the processor needs less time to crunch numbers. Plus the Turbo Boost automatically increases the speed as needed up to 3.1GHz. Before you check out your inexpensive Macbook Pro, you should go through the menu options in the exclusive GainSaver Configurator. You can boost the performance of your Macbook Pro with a bigger, faster hard drive and more memory to handle the most demanding software applications. In addition, the performance of the 2012 Macbook Pro easily supports a dual operating system with your choice of Mac OS and Windows to run your PC software. Just select the configuration you want for your refurbished MacBook Pro and then click the Buy Now button to place your order.